We are in an era of intense interest in neuroscience, the field of scientific inquiry focused on elucidating how the brain gives rise to cognition, learning, and behavior. 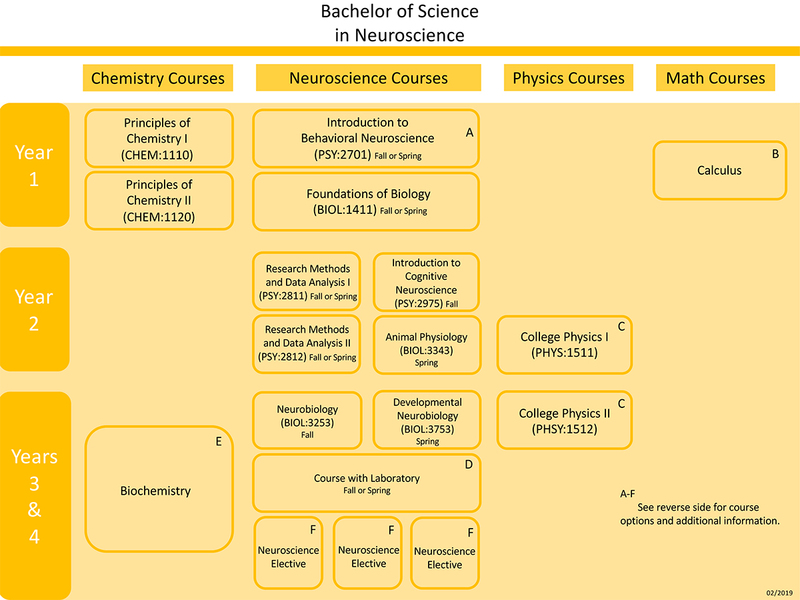 The Bachelor of Science in Neuroscience degree is an interdisciplinary major administered by the Department of Biology and the Department of Psychological and Brain Sciences, in cooperation with the Iowa Neuroscience Institute. Our curriculum ensures that students have broad exposure to the study of neuroscience, from molecules and cells to behavior and cognition. Additionally, students will be required to have sufficient grounding in cognates, such as chemistry and physics, to provide them with a deeper understanding of the methods and discoveries of neuroscience. Those Neuroscience majors who wish to continue their studies in graduate (Ph.D.) or medical (M.D.) school will be rigorously prepared to do so through our integrated curriculum. Neuroscience majors will have the opportunity to pursue Honors research in the major, working in the laboratories of top neuroscientists across campus, including members of the Iowa Neuroscience Institute. A minimum of 6 s.h. over two or more semesters of an independent laboratory research project undertaken in a neuroscience laboratory in either Biology or Psychological and Brain Sciences or in the laboratory of an Iowa Neuroscience Institute (INI) faculty member chosen from a list of approved mentors. Students enroll in BIOL:4995/PSY:4995 Honors Research in Neuroscience. A brief initial research proposal summarizing the background and goals of the planned honors investigations research, submitted to the honors coordinator, typically at the end of the semester immediately prior to the final semester of honors research. An acceptable honors thesis describing the research submitted to the honors coordinator near the end of the final semester of enrollment in BIOL:4995/PSY:4995 Honors Research in Neuroscience. An oral presentation of the honors research findings during the student's final semester. Honors students also are encouraged to participate in the Iowa Center for Research by Undergraduates (ICRU) and to apply for research scholarships, including the Iowa Neuroscience Institute (INI) Summer Scholars Fellowships. 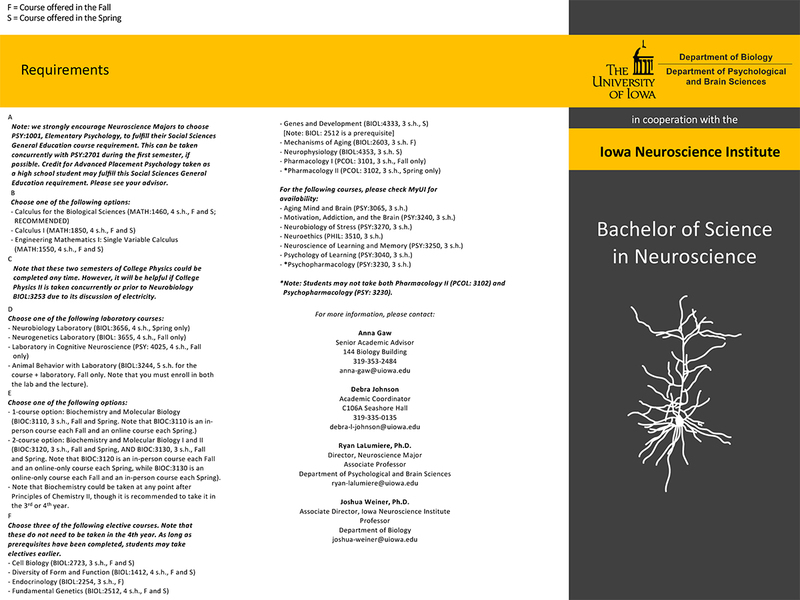 Neuroscience majors interested in graduating with honors in the major should contact the honors coordinator (Dr. Ryan LaLumiere; ryan-lalumiere@uiowa.edu) as early as possible, preferably during their sophomore or junior year. "Going into school, I didn't know what I wanted from college. I knew that I needed to declare a major, but wasn't particularly excited about any specific field. I'd always assumed that I'd go into biology, so, when I met with my advisor, I told her that I was thinking about a bio major with some kind of psychology and/or humanities minor. She told me that I might be interested in a brand-new major, neuroscience. I quickly fell in love with the idea of choosing a neuroscience major. This semester, I took [the] Intro to Behavioral Neuroscience course, and I now can say for certain that I chose the right field. [The] class has shown me what it feels like to be truly passionate about a subject and has given me a field that feels right, that 'clicks'. Thank you so much for creating an environment in this course that has not only taught me an immense amount but has also cultivated my passion for my major and made me feel that I know more clearly what I want for my academic life."